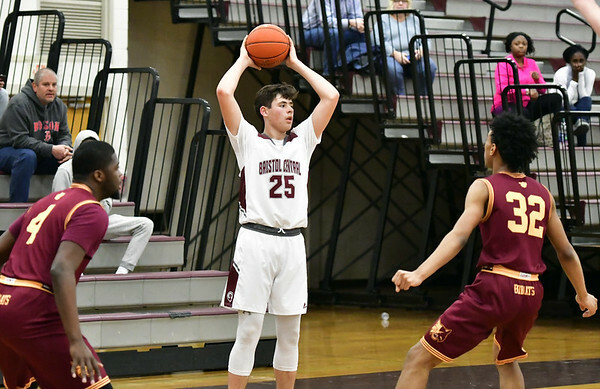 BRISTOL - Berlin pulled away in the third quarter then held off a late rally to defeat Bristol Central 57-49 in a crucial CCC South matchup on Wednesday night. The Redcoats took a double-digit lead late in the third period, but the Rams cut the gap to four with two minutes to play before Berlin put the game away. Gianni Fanelli led the attack for Berlin with 27 points, including four big ones down the stretch. Holden Murphy added 16 for the Redcoats. Sean Wininger and Donovan Clingan had 12 points apiece to lead the offense for the Rams. Clingan also had 12 rebounds for his 16th double-double of the season, but the Rams turned the ball over 21 times in the game and scored only six points in the third quarter as they dropped their second in a row and remained two wins short of the postseason qualifying number. Berlin improved to 10-4, while Central dropped to 6-10 with the loss. BERLIN: Mike Ciarcia 0-0-0, Cam Murphy 0-2-2, Ryan Hyde 1-0-2, Sal Postli 0-0-0, Holden Murphy 6-2-16, Jake Holmes 0-0-0, Giancarlo Tufano 1-0-3, Alex Halkias 2-0-4, Gianni Fanelli 9-7-27, John Addamo 0-0-0, Zach Hrubiec 1-1-3, Paul Damone 0-0-0, Ryan Stec 0-0-0. Totals: 20-12-57. BRISTOL CENTRAL: Victor Rosa 0-4-4, Royon Buchanan 0-0-0, Austin Brown 2-2-8, Calvin Neal 0-0-0, Dillon Hudson 0-0-0, Shane Ouellette 2-0-6, Damion Glasper 0-0-0, Sean Wininger 4-1-12, DOnovan Clingan 5-2-12, Ryan Rodrigiuez 3-1-7. Totals: 16-10-49. Three-point goals: Wininger (BC) 3, Brown (BC) 2, Ouellette (BC) 2, Fanelli (B) 2, H. Murphy (B) 2, Tufano (B). Records: Berlin 10-4, Bristol Central 6-10. Posted in The Bristol Press, Bristol Central on Wednesday, 6 February 2019 21:55. Updated: Wednesday, 6 February 2019 21:57.